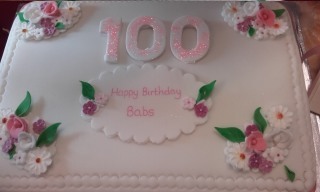 A couple of weeks ago Babs Chamberlain celebrated not just any birthday but her 100th birthday. 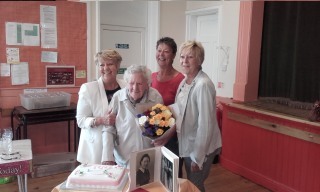 What a fantastic achievement and it was great to see Babs and her family marking the event in St. George’s, rounded off nicely with Babs getting her special card from The Queen. It was good too that her family and Church friends were able to enjoy cake and wine with her after the Parish Eucharist on the birthday itself. At Church we’ve kept quite a few anniversaries recently – Bishop Godfrey and Fr. Ray both marking the anniversaries of their Ordinations – Godfrey 60 years and Ray 45 years. Steve and Jane Cook kept their 40th wedding anniversary whilst among others we congratulated Ben Trimby on gaining the Boy’s Brigade Queen’s Award and Ellen Deal on getting a place at St. Peter’s Primary School. St. George’s is very much a living Church, but more than that, St. George’s Church isn’t the building it’s the people. Of course we love and maintain our building and thanks to the team of ladies and gentlemen who do so each week – often unseen. It’s the people, though, who are most important – without them there would be no St. George’s Church, so it’s absolutely right that we make the most of special occasions and celebrate with individuals and families from the Church. It shows we’re a Church where people matter. St. George’s doesn’t just mark people’s good occasions but prays with them and mourns with them on the sad occasions too. This is a real strength and we must make sure that this care for individuals doesn’t get lost as our “family” grows and changes. For just a few moments today, the sun is shining! Yes – it really is summer, so be it hot or cold, sunny or wet, have a good summer and don’t forget that each Sunday and Wednesday the “family” of St. George’s is waiting to greet you in the Eucharists.